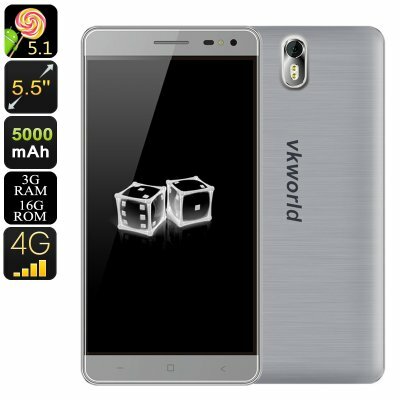 Successfully Added HK Warehouse Android Phone VK World G1- Octa-Core CPU, 13MP Camera, Dual-IMEI, 5.5 Inch Display, 3GB RAM, 5000mAh (Gray) to your Shopping Cart. At the rear of this cheap Android phone, you can find a high-end 13MP camera that lets you snap breathtaking images and ultra-sharp footage of all those special moments in life. Whether you’ll be attending a birthday party, enjoying a beautiful view, or simply spent a day out with your best friend – with this phone in your pocket a great memory never again passes by uncaptured. Additionally, it also comes with an 8MP front snapper that lets you engage in great online video calls and brings along great opportunities for all selfie lovers out there. With 16GB of internal storage and a 64GB SD card slot, you can be assured there’ll always be enough space to store all your latest pictures and video’s snapped with these mesmerizing smartphone cameras. Within its thin body, the VK World G1 Android phone packs a sophisticated Octa-Core processor that is capable of reaching clock speeds up to 1.3GHz. Along with 3GB of RAM, this mobile phone delivers a speedy performance that lets you enjoy mobile games, movies, and applications without dropping a frame. With access to the Play Store, you’ll be able to fill up your Android smartphone with years’ worth of mobile entertainment – ensuring that you’ll never have to be bored again the next time you head out of the house. With its Dual-IMEI numbers and 4G network support, this Android phone certainly brings along top class connectivity and makes sure you’ll stay connected to all your loved ones at any time of the day. The possibility to throw in two 4G SIM cards and be reachable to two phone number simultaneously brings along great efficiency for those of you that often travel abroad or are looking for an efficient way to separate work and private life by using merely one device. Whether you use it for business or entertainment, this Android mobile phone is guaranteed to meet all your smatphone demands. The VK World G1 comes with a 12 months warranty, brought to you by the leader in electronic devices as well as wholesale electronic gadgets..